Improvements in medical evacuation technology and organization, particularly the use of helicopters, played a major role for US forces in Vietnam (1962–1974). Medics splinted and bandaged the wounded patient, frequently radioing the hospital and warning of his arrival and diagnosis. Helicopter evacuation minimized the use of morphine, eliminating an additional complication. The hospital mortality rate was slightly higher than in Korea, 2.6%, but that increase is probably misleading, as more rapid transport delivered wounded soldiers who would have been listed as killed in action in Korea . Mortality from abdominal wounds declined to 4.5%. 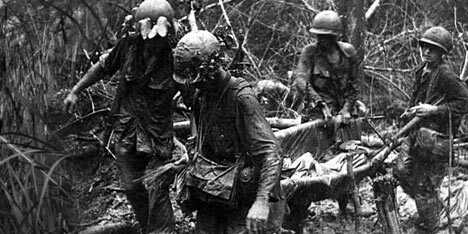 Most soldiers wounded in Vietnam were delivered from the battlefield to fixed hospitals with the capacity to provide definitive treatment, eliminating the need for multiple transfers and levels of care. Patients not expected to return to full duty within 30 days or less were evacuated to hospitals in Japan and the United States.